Day 1 of Toronto Fashion Week kicked off with a bang. Backstage at Mayer Man, the first show of the day, Simone Otis of beautyBOUTIQUE by Shoppers Drug Mart perfected models’ skin by covering redness, then filled in brows slightly to give a full, natural look. The Victoria Radford hair team kept locks undone and somewhat messy, using pastes and sprays to achieve a smooth finish. At Eleventy, the beauty look was decidedly minimal: Otis used only a few key products to get the “no-makeup makeup look.” She applied foundation and concealer, a swipe of black mascara on lashes, a coat of nourishing oil on lips and used brow pencils to fill in arches. “Brows are bold and strong, but still believable,” says Otis. For hair, Saira Remtulla, senior stylist at Victoria Radford, created a slick, pulled-back look on the models. Hair was flat ironed, parted in the middle, then swept off the face and tied in a low ponytail at the nape of the neck. Remtulla used a light hold hairspray to tame any flyaways. The next show was Triarchy, where glitter was the main focal point for the makeup. “The look is very rock and roll,” says Otis. “It has a roughed up feel. It’s not too precious but still has glam to it.” Otis applied two shades of glitter—gold and silvery opal—on the lower eyelids down to the cheeks, polishing the look with bronzer and a neutral lipstick. For hair, Victoria Radford’s team opted for messy beach waves with the “I woke up like this” vibe, using plenty of texture sprays and voluminizing products. The second last show of the night, Narces, channeled the disco era in its beauty look. Otis buffed glitter onto lids, blended a warm copper shade through the crease of the eye and used black liquid liner and full strips of lashes. 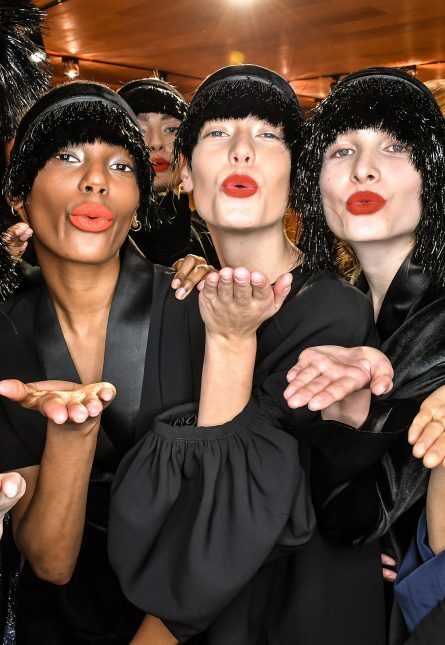 “We wanted the look to have a ’70s feel but still be very pretty.” Otis then swiped a neutral lipstick on the models’ pouts and added a pearlescent topcoat to reflect light. The hair had a ballerina vibe, slicked back into a modern bun that sat at the nape of the neck. 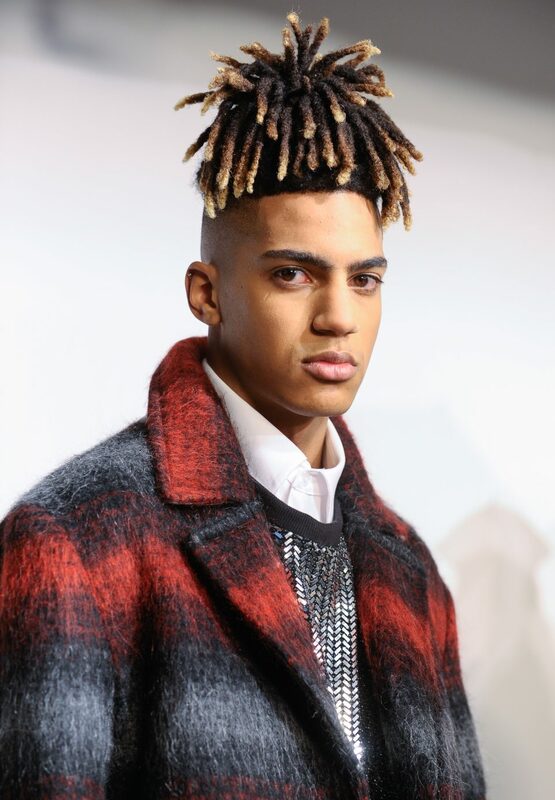 Christopher Bates—the final show of the evening—focussed on men’s grooming, “Christopher likes the guys to look more traditional but not too rugged,” says Otis. “They have soft lips and shinier skin.” This meant minimal grooming: prepping skin with moisturizer, applying a light lip balm and combing and filling in brows if needed. The hair looks were about using root lift and hair paste for a structured yet natural look.